Let’s just get the California politics out of current partisan bickering. Let me be plain about this. If you are blaming Trump or blaming Jerry Brown or thinking of this in any current political way, you are ignorant. Cut it out. This issue is too important and too long lasting for dummies to get upset about and upset others with partisan politics. Sorry to be so blunt, well not sorry. I was looking for some perspective, so I went to the work of one of America’s leading authorities on wildfire. 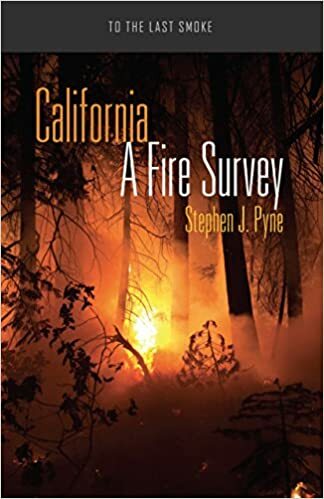 I read some of his books before, but this time I picked up the one specifically on California, “California: A Fire Survey” linked below. Let me highlight a few points. This fire controversy has been going on for more than 150 years. It is not a Trump problem or a liberal-conservative issue. It is a discussion of what is right AND it is protean, in that science is being developed constantly and practices are informing and shaping realities on the ground. There are few things more complex than wildfire and the politics (not the current partisan ones) make it worse. The controversy about prescribed fire is very old. Native Americans burned in patches. They had thousands of years of experience and practice living in an exceptionally fire-prone region. They evolved appropriate responses. Spanish and the Mexican colonization did not greatly impact fire regimes. Fires still burned regularly, sometimes still set by Native Americans and sometimes by ranchers. The population was not dense. All this changed rapidly after the 1849 gold rush and rapid population growth. Californians debated fire. Some were on the side of what they called “light burning”, as the Indians had done. Others wanted to excluded fire. This was part of the original progressive wave that sought to rationalize everything and manage nature. In 1923, a commission formally anathematized the practice of light burning. Let’s explain a little. You can identify at least three “fire cultures” in the USA. The SE has a tradition of burning that persists to this day. The Rockies manages fire over large areas and sometimes experiments with natural fire. California has been in the forefront of suppression. Fire there is put out and not started by humans. The idea is to protect assets, houses, infrastructure and timber. The idea that goes with suppression is that fire is an enemy to be attacked and defeated. There exists a type of “fire-industrial complex.” It deploys fire fighters in military fashion and brings with it military style equipment, big machines, helicopters and airplanes. All these things make great and heroic pictures. There is also the wonderfully poignant quality of homeowners fighting flames and the profound sadness of loss of homes and lives. The problem with this whole Hollywood style narrative is that it is often very much effort and heroism applied to a problem that might better be avoided against an enemy (fire) which need not be our enemy and may be an ally in land management. Fire is unavoidable. It is not an enemy that can be defeated. It is not an enemy at all. It is a part of the natural order. If you think in ecological terms, fire is an apex predator. It orders much of the natural landscape and when it is taken away that landscape declines Unlike an animal predator, however, it cannot really be extirpated. There is no extinction. In fact, it grows bigger, angrier and more destructive when excluded and transforms from a cleaner of the landscape to a destroyer. In the midst of these big fires, it is inappropriate to fix blame, but when they go out, we need to put in better fire regimes. We need to recognize fire’s power and know that we cannot defeat it but we can live with it and thrive in fire adapted landscapes. We can get more if we do not try to have it all. This entry was posted in Conservation & Environment, Conservation & Environment. Bookmark the permalink.